Krystal has been riding horses since 1992 for both pleasure and competition, and rides and coaches both Western and English. Her experience includes teaching and barn management since 2003, and volunteering with the PRDA. 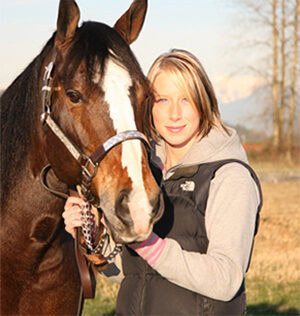 She is a Certified Competition Coach, and she has completed the Equine Canada Rider Prep Level Eight English and Level Four Western, as well as her NCCP course. She is First Aid Certified through St. John’s Ambulance.